GOODLETTSVILLE, Tenn.--(BUSINESS WIRE)--Nov. 9, 2018-- Dollar General (NYSE: DG) is excited to announce its 2018 holiday promotions, which will offer savings at its more than 15,000 stores across 44 states. The Company expects to deliver savings through both everyday low prices as well as special coupons that provide the value and convenience customers have come to know and trust from Dollar General. This holiday season, customers can round out their shopping needs at a convenient, neighborhood Dollar General store and find everything from on-trend home décor and favorite meals to a variety of gift options to delight friends and family alike. In addition, Dollar General plans to give back this season by furthering its mission of Serving Others. The Company plans to donate nearly $600,000 to support community schools, libraries, the Marine Toys for Tots Foundation and St. Jude’s Thanks and Giving® campaign. Dollar General will proudly recognize the military community on Sunday, November 11, 2018, with an 11% discount on in-store and online purchases for all veterans, active duty military, members of the National Guard & Reserve and their immediate family members. This discount will be available in all store locations or online by using the promo code MILITARY11. As part of nearly $600,000 in contributions this holiday season, Dollar General will continue Serving Others by donating $400,000 to support schools and libraries in local communities. From November 16 through December 7, Dollar General will host local toy drives to make the holidays brighter for families this season in partnership with the Marine Toys for Tots Foundation. Also beginning on November 16, Dollar General will host an in-store fundraiser to benefit the St. Jude Thanks and Giving® campaign through December 16. Customers can donate in all Dollar General store locations to support St. Jude Children’s Research Hospital. To further support these initiatives, Dollar General plans to donate $100,000 to the Marine Toys for Tots Foundation and $75,000 to the St. Jude Thanks and Giving® campaign. Happening now, customers new to Dollar General’s Digital Coupon platform can sign up to receive $1 off their first $1.01 or more in-store purchase. Digital Coupons can deliver approximately $200 in savings throughout this holiday season, and customers can also access weekly deals all year long. To join the Dollar General Digital Coupons program, customers should visit www.dollargeneral.com/coupons to sign up or click on “Digital Coupons” in the DG mobile app for smartphones. Dollar General will help shoppers prepare for the holidays by kicking off Thanksgiving week with seven days of savings. For four days only, beginning Sunday, November 18, and continuing through Wednesday, November 21, Dollar General will offer special holiday deals on Thanksgiving meal essentials, bakeware, batteries and electronics, movies, holiday home décor, gift options and more. Special deals include buy-one, get-one (BOGO) offers and other significant, limited-time discounts. The savings continue with special one-day-only deals on Thanksgiving Day! On November 22, shoppers can save on LEGO® sets, as well as BOGO-75% off on all toys. As Seen on TV items are also BOGO free. 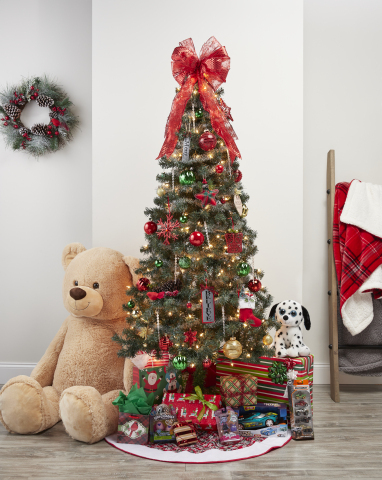 Additionally, customers can save 50% on tree décor, including holiday lights, trees, ornaments, tree skirts and tree toppers. To round out the Thanksgiving holiday, Dollar General will offer customers additional savings beginning Thursday, November 22 through Saturday, November 24. Shoppers can upgrade their kitchens with savings on select small appliances, and take advantage of great deals on pantry staples. Those looking to update their home décor, can shop for select new framed artwork or scented candles, both on sale for BOGO 50% off, while enjoying additional savings on a wide variety of other decorative touches. Dollar General is proud to offer customers holiday exclusives on two well-loved brands. Beginning in mid-December, Dollar General will offer customers a taste of the holidays with a brand new Java Monster® Swiss Chocolate beverage. Available exclusively at Dollar General through February 2019, this coffee+energy beverage captures the taste of the season with a sweet coffee flavor while packing in the energy customers crave. Also available beginning in December, customers can try the new Centrum Energy Multivitamin®, which includes vitamins and minerals aimed at promoting overall wellness this winter. The Centrum Energy Multivitamin® high potency formula provides customers with an option to couple the whole-body health benefits of a multivitamin with Super B Complex for energy support. Customers can purchase the Centrum Energy Multivitamin® exclusively at Dollar General through January 2019*. Dollar General has everything shoppers need to prepare their homes for the holidays. Customers can trim a tree with $1 ornaments or purchase new holiday lights to brighten their homes. Christmas trees are also available in multiple sizes, including an exclusive snowman tree for only $30. Customers can also show off their holiday spirits with affordable, on-trend gift wrapping paper, gift bags, bows and ribbons that are sure to add a special touch to each gift giving occasion. Customers can create a cozy environment, from their front doors to every room in their homes. From festive wreaths, to holiday throws, ranging from $5 to $18, to signature scented candle options from Dollar General’s exclusive trueliving® brand. After preparing delicious holiday meals, shoppers also can create the perfect table setting with table runners, place mats, dinnerware and beautiful centerpieces. Families who are getting ready to host a holiday gathering can click here to find decorating inspiration for the holiday table, home and tree with Dollar General’s Holiday Savings Guide. Convenient Dollar General locations offer more than just home décor and seasonal products. Shoppers can get in and out quickly with essential items like milk, sugar, eggs, vanilla and baking mixes. Stores also carry an additional assortment of fresh and frozen food options to complement nearly every dish on the holiday menu. Shoppers can also prepare for a holiday get-together by stocking up on cleaning items. Paper products and cleaning solutions are must-haves when hosting a party, and customers can count on Dollar General to provide the items they need to make their homes sparkle for the holidays. This season, consider Dollar General as a holiday shopping destination. With options for him, for her, for kids, for pets and everyone on your shopping list, customers can feel great about choosing the very best gifts at everyday low prices. Take his gift up a notch with a subscription to DG Shave Crew™, a subscription program for razors and cartridges. Choose a cartridge count, set a schedule and receive free shipping along with a 100% satisfaction guarantee. Subscribe and save for a gift that will keep on giving throughout the year. Make his life easier with a power remote or a grilling apron he can use in the warmer months, or keep it practical with a new air compressor or car vacuum. Upgrade his winter wardrobe by gifting a new jacket or winter vest. Essential items like socks, t-shirts and bath products are always appreciated and make great stocking stuffers. This holiday, treat her to a new clutch or a pair of fashionable shoes so she can stay stylish all winter long. If she prefers gifts for her home, Dollar General offers a large assortment of candles, picture frames and more to build the perfect gift basket she will cherish. Dollar General is also offering new luxury bath sets this holiday. With options like bath fizzers, bath salts and facial masks, she can stay pampered beyond the holidays and into next year. Starting now through December 24, 2018, shoppers will receive a 25% discount off all qualifying toy purchases of $75 or more, both in-store and online. This offer cannot be combined with additional toy promotions. Children of all ages are sure to enjoy some of the season’s hottest toys including LEGO®, which Dollar General is now offering for the first time! Be the hero this season when gifting the popular As Seen on TV item, Zoom Tubes Car Trax™. Dollar General also offers a wide selection of other popular toys from My Little Pony®, Spider-Man®, Barbie®, Frozen®, Monster High®, Disney®, Hot Wheels®, Paw Patrol®, Doc McStuffins®, Trolls®, Fisher Price®, LOL Surprise®, Mattel®, Hasbro®, Fingerlings®, Hatchimals®, Hopkins®, Pikmi Pops®, Marvel®, Discovery Kids®, Nerf®, Play Doh®, JoJo Siwa® and more. To see all of Dollar General’s new and exciting toy offers, visit the Dollar General Toy Book online here. Whether welcoming a new pet or spoiling the family’s fur baby, don’t forget to choose something special to celebrate your furry friends! With pet beds in assorted sizes, popular pet foods, treats, toys and even a pet treat launcher, Dollar General is a destination to treat everyone this season! Whether buying gifts for teachers, service providers, friends or other loved ones, consider going the DIY route and making personalized gifts like handcrafted ornaments or inexpensive Mason jars or holiday tins brimming with ready-made cookie mix. Create a seasonally themed libation with a mug stuffed with their favorite coffee or give a bottle of wine in an adorable holiday gift bag. For technophiles, Dollar General offers a variety of affordable options including a Wi-Fi drone with a camera, a voice-enabled speaker with Siri™ and Google Assistant™, Bluetooth™ speakers, retro gaming consoles, classic mini arcade games, cellular phone options, DVD players, electronic tablets and more. Keep the whole family cozy in matching pajamas this holiday with $5 plush sleep pants for men, women and kids. Capture this perfect photo opportunity and create holiday memories! If you can’t decide between all of these amazing gift ideas, why not consider purchasing a gift card at Dollar General this holiday season? Dollar General offers a variety of gift cards in a number of denominations to fan-favorite stores or restaurants that can surprise and delight even the pickiest gift recipient. • Thanksgiving Day: All stores will be open from 7 a.m. to 10 p.m.
• December 21-23: Extended closing to 11 p.m.
• Christmas Eve: All stores will close at 10 p.m.
Dollar General store operating hours may be found on the store locator here.